Have you ever considered the difference between the price of a decision vs the cost of a decision? I recently attended an event and had the pleasure of hearing Terry Slattery speak about his book, The Cinnamon Story. His message regarding the differences between focusing on the price you are paying for any product, service, or staff versus the cost you are spending to achieve your targets and goals, brought this simple yet complex conversation to light. In business, whether we are looking at this issue as a consumer of products and services or as a provider of products and services we need to understand the differentiated value our sale or purchase brings. The price of our product or service is one of the first questions we are asked and depending on how we present that information and the customers’ perception of us, that one question could be the beginning or end of the conversation. You may miss out on the opportunity to work with that customer if your focus is only on sharing the price of your product or service and not the full differentiated value you bring to them. 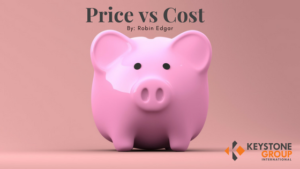 Cost is the overall cost of each decision made and how it can affect the overall profit and bottom line of all actions you make in your business. Many times, a decision is made that will be the least expensive in the short-term and the purchasing department is applauded for their ability to save money. In these situations, do we ever step back and conduct a more comprehensive and thorough analysis of what the entire cost is of buying that product or service? Are we considering any of these issues? The long-term relationship with that vendor and what they do for us- do they bring us connections that we would not be able to access on our own? These are just a few of the issues that should be considered before making a purchase, to be sure you have considered the entire cost of that decision for the long-term. Keep the price vs cost analysis in mind the next time you are looking to determine what needs you have to achieve your goals. You may realize your focus on price could be the one thing that is standing in your way from actually achieving your success. Securities offered through Concorde Investment Services, LLC (CIS), member FINRA/SIPC. Investment advisory services offered through Concorde Asset Management, LLC, (CAM) a SEC registered investment advisor. Insurance products through Concorde Insurance Agency, Inc. (CIA). Keystone Group International and Robin Edgar Investments is independent of CIS, CAM and CIA.